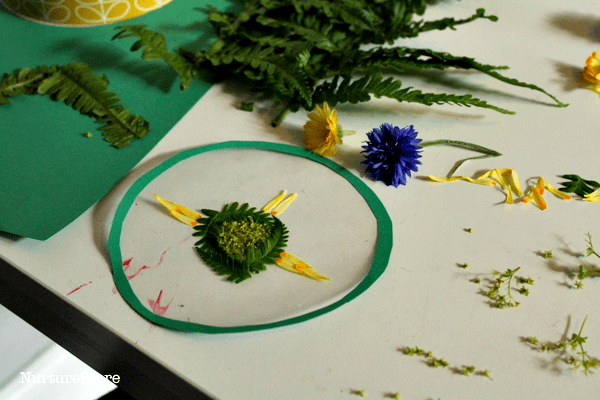 Combine natural, sensory materials, art, math and a little meditation and make some pretty flower mandala designs. 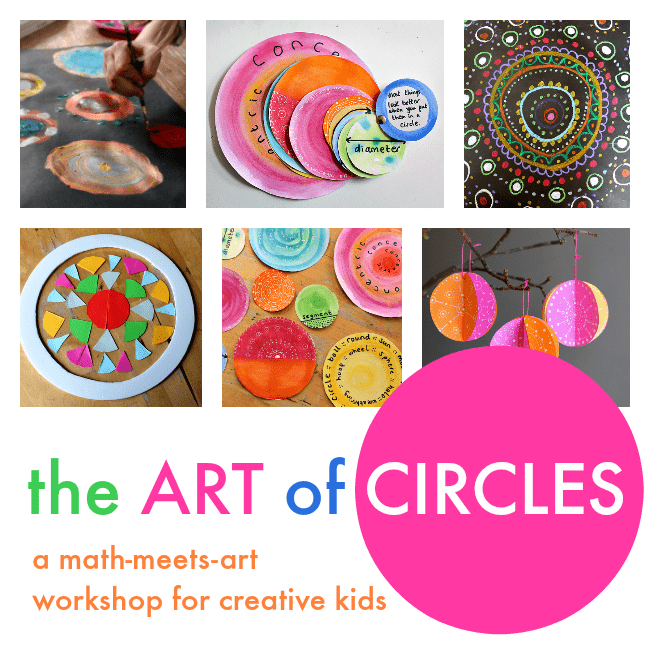 >>> Join my Art of Circles workshop here! A mandala is a circular symbol, often seen in Hinduism and Buddhism, which represents the universe. It can be used as a focus for meditation, and making one is very calming and centring. 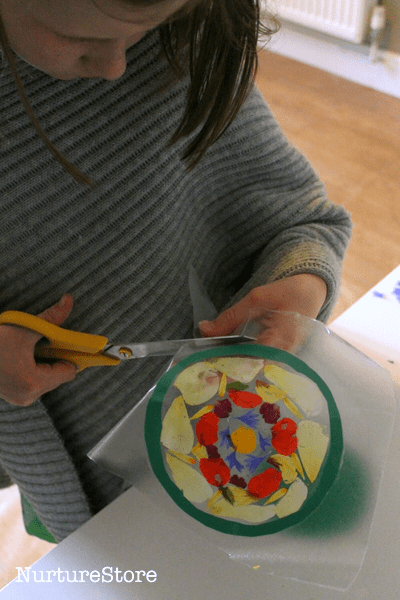 Today we’re using flower petals and contact paper to make suncatcher mandalas. Start by drawing out a frame on a piece of card. Traditionally mandalas are circular, but you could use a square, rectangle, flower, or heart shape. 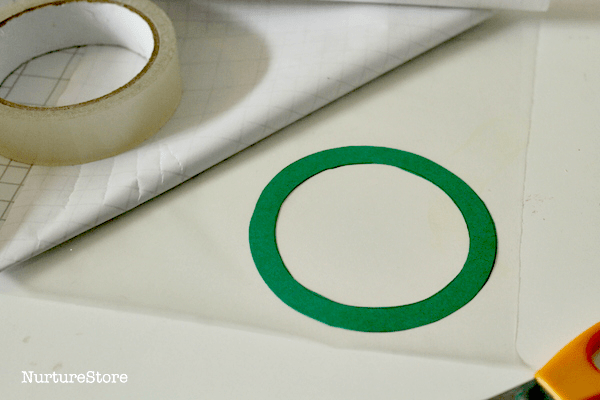 Place your card frame on a piece of contact paper (sticky backed plastic), trim round the outer circumference with scissors, and you’ve made your sticky canvass on which to create your mandala design. Then you’ll need some flowers. We picked a few from our garden classroom, but you could use weeds or wild flowers from a nature walk, or buy some especially for your project. You don’t need very many, as you will be using individual petals for your designs, and you can use any colour combination that appeals to you. Using flowers in art brings another sensory dimension to the project. 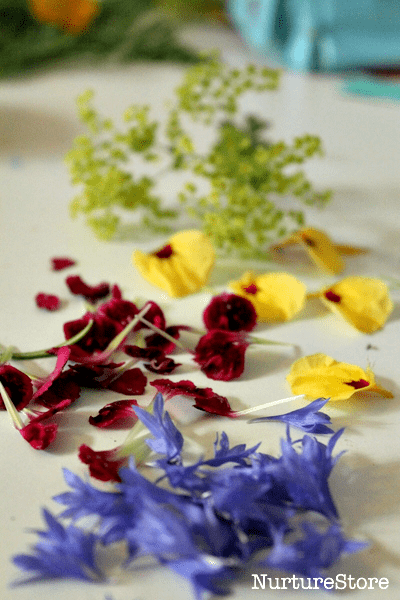 We used cornflower, calendula, nasturtium, dianthus, rosemary, ferns and alchemilla mollis (lady’s mantle) and mint, and the smell was wonderful. 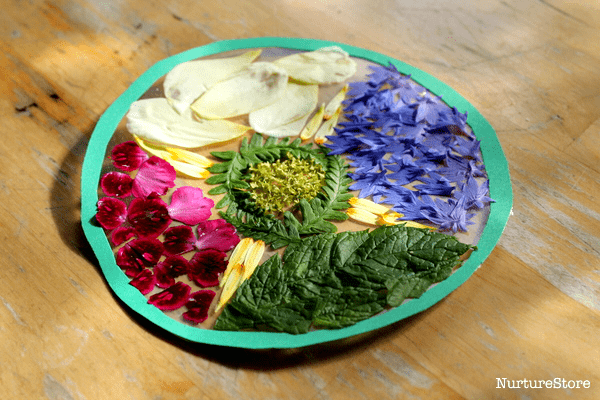 Carefully separate your flower petals and then you can begin to design your mandala wheel. 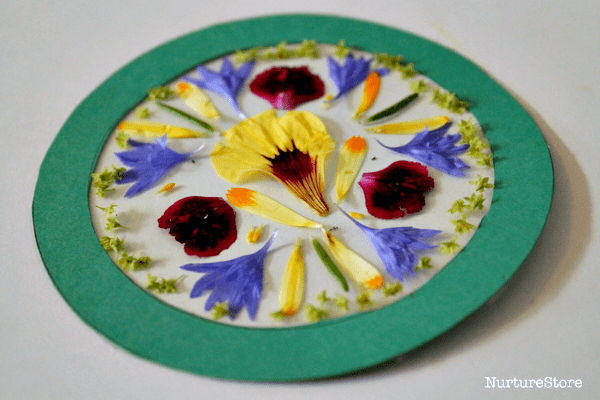 You could divide your circle into fractions and fill each with a different flower. Or make concentric circles or repeating patterns. A great thing about working with contact paper is that you can gently peel flowers off and replace them, changing your mandala design until you are happy with it. Once you have created your finished design, stick another layer of contact paper over the petals, so they are encased inside. 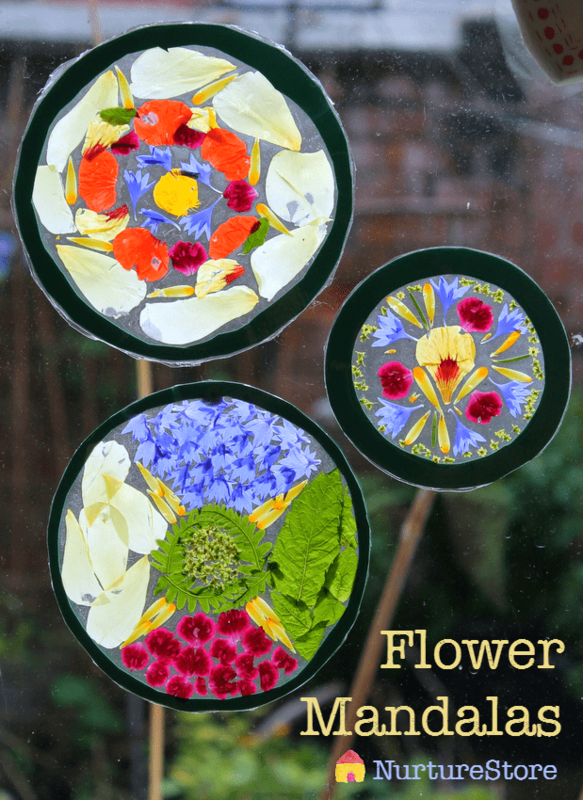 Then you can place your flower mandalas in the window and watch how the light shining through them really makes the flower petal colours sing. Nurture art with the Art Spark resources! 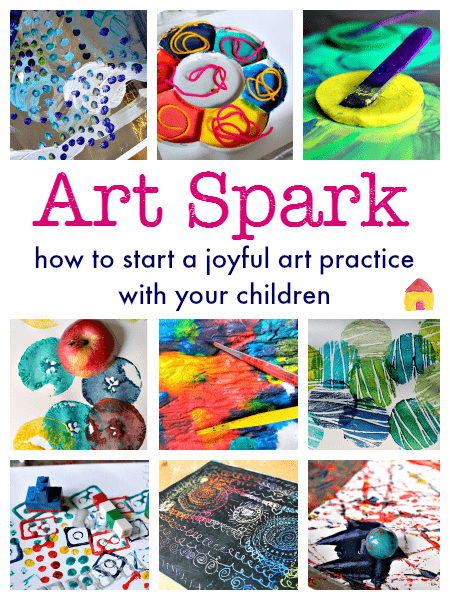 My Art Spark resources will give you everything you need to start a joyful art practice with your children. There are two new ebooks and an online art course for your family or class. Use them and you’ll be bursting with enthusiasm and ideas that will help you make art happen. Click here to see more. 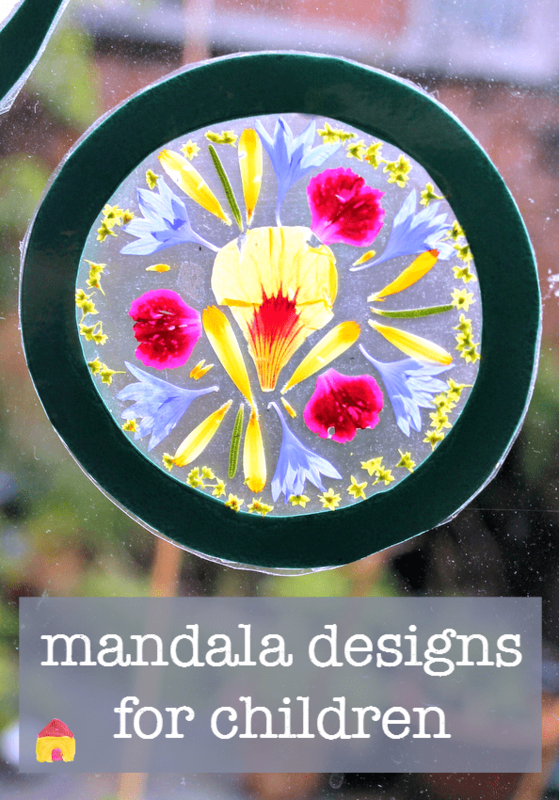 How do you stick the mandalas to the window? We used sticky blu-tack on the frames. 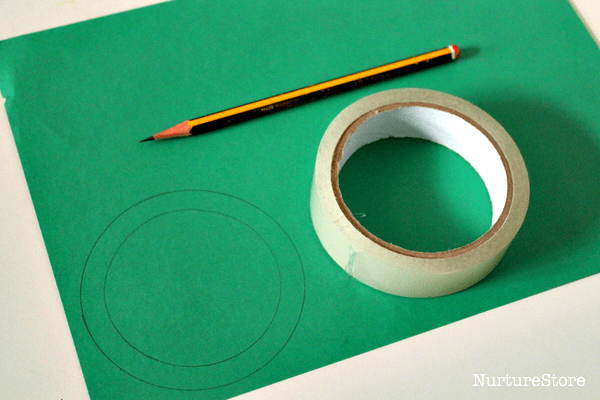 I think this is a wonderful idea and it would be a great way for children to use the circles for cutting out activities. We love to go out for nature walks and I am wondering about the rules around picking wildflowers. 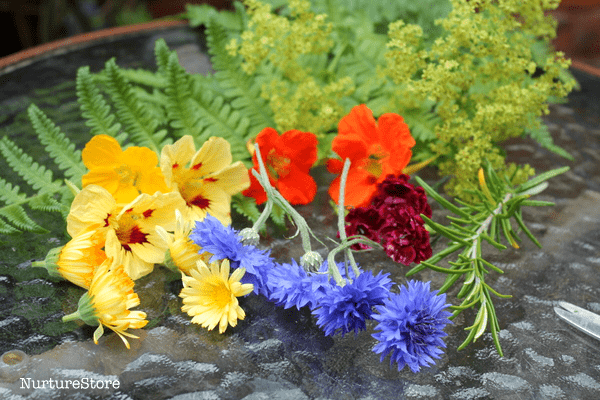 Did you use flowers from the hedgerow or gardens please? Thank you for sharing this wonderful idea. Is there a way to keep the flowers from getting moldy? Hi Laura. You could press the flowers first and use the dried petals. Thank you. I love this idea, I did this last year and they ended up moldy after about a week. I was hoping their was something I could spray on them to preserve a little longer. Thank you for your help!